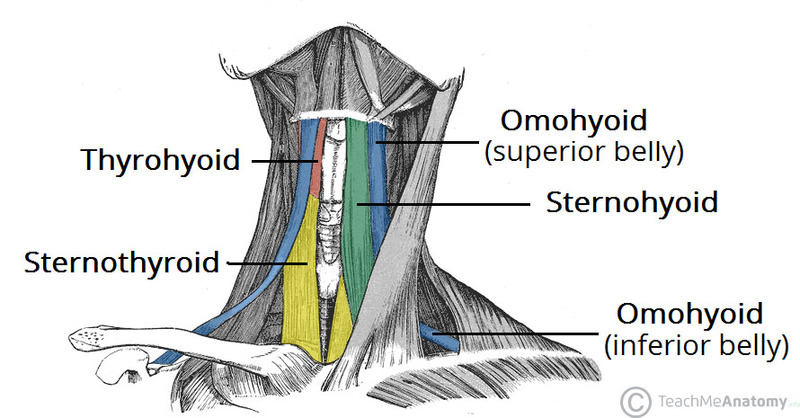 Superficial plane – omohyoid and sternohyoid muscles. Deep plane – sternothyroid and thyrohyoid muscles. The arterial supply to the infrahyoid muscles is via the superior and inferior thyroid arteries, with venous drainage via the corresponding veins. In this article, we shall look at the anatomy of the infrahyoid muscles – their attachments, actions and innervations. The omohyoid is comprised of two muscle bellies, which are connected by a muscular tendon. The inferior belly of the omohyoid arises from the scapula. It runs superomedially underneath the sternocleidomastoid muscle. It is attached to the superior belly by an intermediate tendon, which is anchored to the clavicle by the deep cervical fascia. From here, the superior belly ascends to attach to the hyoid bone. Actions: Depresses the hyoid bone. Innervation: Anterior rami of C1-C3, carried by a branch of the ansa cervicalis. Fig 1 – Lateral view of the infrahyoid muscles of the neck. The sternohyoid muscle is located within the superficial plane. Attachments: Originates from the sternum and sternoclavicular joint. It ascends to insert onto the hyoid bone. The sternothyroid muscle is wider and deeper than the sternohyoid. It is located within the deep plane. Attachments: Arises from the manubrium of the sternum, and attaches to the thyroid cartilage. Actions: Depresses the thyroid cartilage. 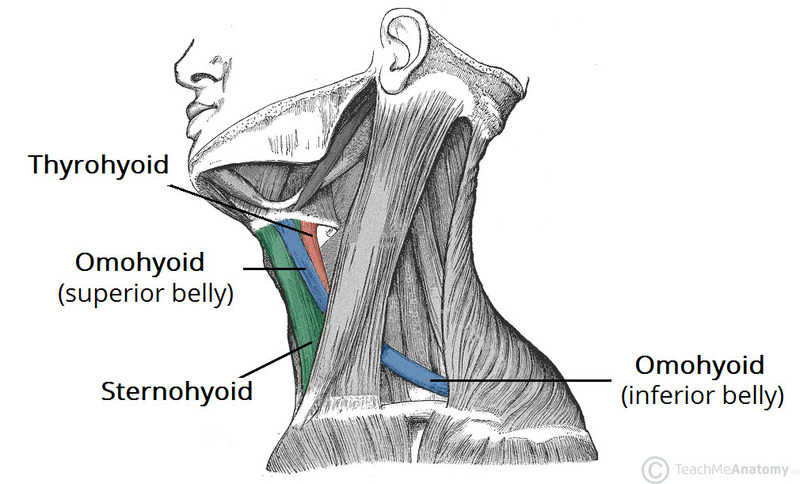 The thyrohyoid is a short band of muscle, thought to be a continuation of the sternothyroid muscle. Attachments: Arises from the thyroid cartilage of the larynx, and ascends to attach to the hyoid bone. Actions: Depresses the hyoid. If the hyoid bone is fixed, it can elevate the larynx. Innervation: Anterior ramus of C1, carried within the hypoglossal nerve. Fig 2 – Anterior view of the infrahyoid muscles of the neck. Which of the infrahyoid muscles are found in the deep plane? Which infrahyoid muscle is a continuation of the sternothyroid muscle? Which of the following describes the innervation of thyrohyoid?